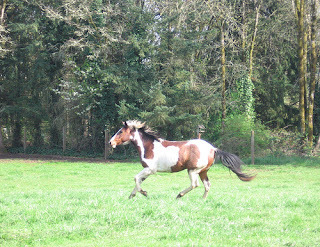 My dream has always been to own a horse. They have always been a symbol of freedom to me. I took riding lessons for a few years when I was young and actually got to the point of jumping, but what I really wanted to do was just take off the tack and saddle, hop onto it's back and let the horse run with me hanging on for dear life. My instructor would have never allowed that for obvious safety reasons, but I secretly imagined it (and still do). 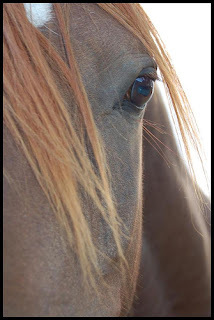 The strength, gentleness, and wildness that I feel when I am around horses draws me to them. I feel like a WOMAN! Like the woman God made me. Yes, it may sound funny or cheesy to some of you out there but I can barely look at a horse without any emotion, its like a trigger for me. Its like all the build-up of expectations, worries, let-downs, chores, and responsibilities just fall off as I just soak in the beauty of these creatures. It's like I'm looking straight at a vision of God. As a little girl, there were many times I just wanted to show everyone how wild and beautiful I was, but for some reason I knew that was "wrong". Something told me that if I did play out this beauty, I would be rejected. I knew that I should just let my dreams be dreams and my ideas be for some other person. So I stuffed it, for the most part, just like most other little girls. My rebellion came as a result. I was bitter, angry, emotional, confused, and most importantly determined that there was something more out there than just being a "nice, pretty" girl. I was determined to show the most important people in my life (my parents and my peers) that I was more than what they thought I was (or at least what I thought they thought I was). So I got wild (drunk, wasted, high, knocked up) and I got beautiful (lots of boyfriends, the "right" friends, makeup, the "right" clothes, etc). But I was sad, depressed, and felt like crap. The wild and beautiful woman that I had imagined was gone. Sad, huh? Well, the story gets lots better...fortunately God gave me a determined and brave heart. Somehow, only by the power of God, I literally started shaking off the tack- the reigns, the bit, the saddle, the saddle pad and started experiencing the beauty of God in me again. After much hard work and perseverance I am FREE! And now I realize where my freedom and wildness comes from and why I have always felt it. God put it in me to be His Beauty, He put Himself in me! How amazing! And so now, whenever I look at a horse, watch a horse movie, or even think about riding a horse it makes me think about the reason I was made. I was made to be beautiful and wild for His glory. That's it. the words you used to describe your desire to be free are from the Lord! As i read your blog i almost cried looking back on how caged we all feel at times. The Lord is so faithful to our desires and wants because as you wrote "He made us with those desires to be free"!